Not many people would have heard of the name Doodhpathri. And the ones who did would either have already visited Kashmir at least once; or must be planning to be there in near future. Even I got to hear this name when I was thinking of a week long trip to explore Kashmir; and a friend who is a local from Srinagar suggested Doodhpathri. On his recommendation, I included it in my itinerary and must say that I am glad I did. It is a very scenic spot, is not at too great a distance from Srinagar, and in my opinion, is a must visit for anyone who is visiting Kashmir and would like to include a few offbeat destinations. For a brief introduction, Doodhpathri is a small hill station in Kashmir region. It is located at an altitude of 8,957 ft, and at a distance of about 45 kilometers from Srinagar. It is one of those areas that have not yet become too popular among tourists and probably never get crowded. 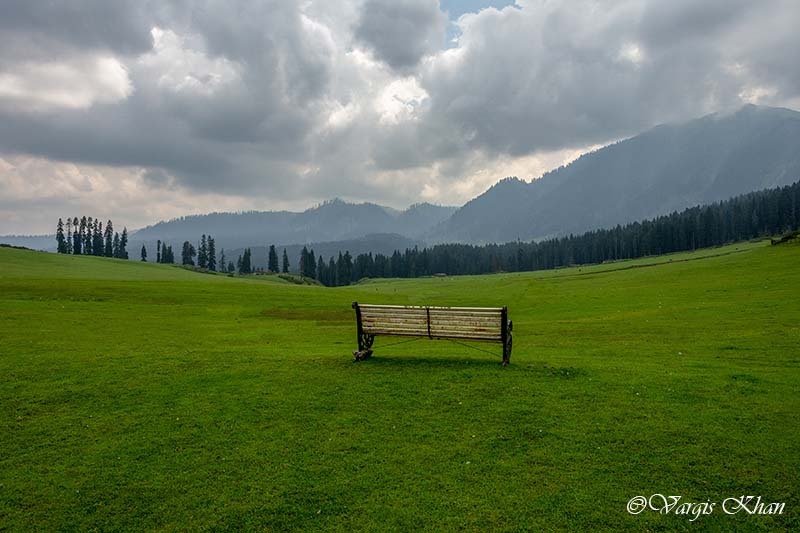 While destinations like Gulmarg and Pahalgam get plenty of tourists each year, Doodhpathri do not see too many visitors. Majority of the people I have found visiting Doodhpathri were actually Kashmiri locals only; families out for an outing and some school kids for a picnic. It reminded me a bit of Khajjiar in Himachal but far more grand and beautiful. A trip to Doodhpathri can actually be done in less than half a day even. From Srinagar, the place is located about 40 to 50 kilometers and you can get here in less than 2 hours. To arrive here, spend some time and to reach back Srinagar can easily be done in 6 hours at most. If you are going to be in Srinagar anytime soon, then I must urge you to plan a short visit to Doodhpathri. You will really like it. The name Doodhpathri literally translates to “Valley of Milk” and there is in fact an interesting tale about how this place got named as such. It is said that a famous Kashmiri saint, Sheikh Noor din Noorani, used to pray here. Once he was looking for some water in the meadows to prepare for his prayers; and while doing so, pricked the ground with his stick. The moment he did that, milk came bursting out of the ground. Sheikh Noorani however refused to use milk to wash his hands and face for prayers, saying that milk can and should be used only for drinking. Upon his refusal, milk at once changed its state to water and hence the meadows here got names as Doodhpathri. You may not find milk out here coming out of the ground but what you will indeed find is plenty of natural beauty to leave you mesmerized. Interestingly enough, the water that now flows through the meadows and the valley has a very milky appearance; which could also be the reason why the place gets called Doodhpathri. The lush green grasses over the vast meadows; and silver shining streams running over the large stones further increase its beauty. The first answer to this question is all that I explained above. You visit Doodhpathri to witness the natural beauty at its best. 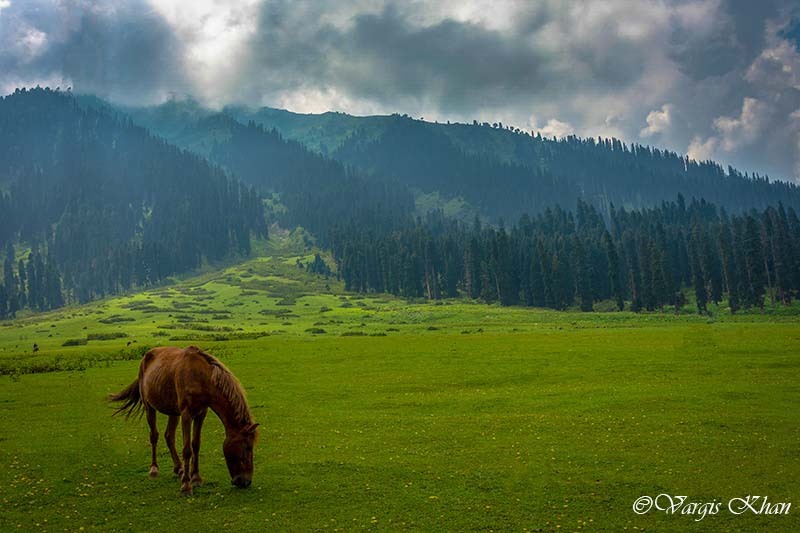 It is places like this for which Kashmir is fondly known as a paradise. Another reason however could be that Doodhpathri was quite recently included in the list of tourist places in Kashmir. Until some time ago, this area was not open for tourists and due to this, it is still unknown to most of the people. Thousands of tourists pass through Kashmir each year but only a handful come towards Doodhpathri. It however became popular among the locals quite fast. When you go to Doodhpathri, you will realize that it is mostly local Kashmiri families and schools that have come here for picnic. Tourists from other parts of the country will either be missing completely or just a few in numbers. Is Doodhpathri Safe to Visit? Next I will address the question that usually gets asked by everyone when you talk about a vacation anywhere in Kashmir. Is Doodhpathri safe to visit? A one line answer to this question is that yes is completely safe to travel to. If you would however like to read a more detailed version of this answer; then I have covered this topic in a different article Is Kashmir Safe to Visit for Tourists? Apart from my observations of the place, I have also shared a few other safety tips in this article. In order to get to Doodhpathri, you will first have to reach Srinagar which is fairly easy. For people coming by their own vehicle, you can just drive to Srinagar city by either the regular Jammu – Srinagar highway; or the Mughal road through Shopian. Once you arrive at Srinagar, you can then make a road trip to Doodhpathri; which is a 2 hours’ drive at most, covering a distance of about 45 kilometers. If you were however not traveling by your own vehicle, then Srinagar is well connected to rest of the country by Air, Train and Bus service. No matter which part of the country you live in, you can easily reach the city by either flying or boarding a train. Doodhpathri is at a distance of about 45 kilometers from Srinagar. It will actually also depend on where exactly you are starting from in Srinagar. If you were for example coming from a place near Nishat Bagh or Shalimar Bagh or somewhere close to Dal Lake then the distance would be around 50 to 55 kilometers. Once you arrive in Srinagar, reaching Doodhpathri is not that difficult. This place was recently opened for tourists but you do not need any special permission to arrive here. The route from Srinagar to Doodhpathri will be as mentioned below. This entire journey is roughly around 50 kilometers but only the last 10 to 15 kilometers are actually a steep climb. For rest of the part, the road mostly remains flat and you would hardly feel that you are traveling through a hill station. There is another route that comes through Magam. Traveling on this one, you will first reach Magam from Srinagar and then take an internal road via Khan Sahib. The route will then be as below. This however is the longer of the two routes and is about 110 kilometers long. This road is usually taken by people who are returning from Gulmarg to Srinagar and wanted to take a detour while visiting Doodhpathri. Or people who were going to Gulmarg and thought to cover Doodhpathri as well on the way. If you were going straight from Srinagar then just take the road via Arigam. The best, easiest and most convenient way would be to rent a private taxi for the trip. Depending on the type of cab you chose, your total charge for the day would come out to be between Rs. 2000 to Rs. 2500 per day; including fuel and driver. You can either look for a taxi at the airport itself or book one in advance; and have the drive pick you from the airport or railway station. If you wanted to book in advance then talk to Faisal in Srinagar at 9596410670. He is a great guy and will be able to get you a cab for the lowest possible price. It would depend on which cab you chose. For an SUV like Scorpio or Innova, expect the per day fare to be around Rs. 2,500 including fuel. If you chose a hatchback like Etios, this charge would then be around Rs. 1800 to Rs. 2000. For budget travelers, I would still recommend a private taxi if you were traveling in a group and can share the cost among 5 to 6 people. If you were however traveling solo then you can look for a shared cab as well; which in Kashmir is mostly a Sumo. Problem however is that it will not be easy to find. As I mentioned, Doodhpathri is not yet that famous among tourists. On top of it, there is absolutely nothing here except for lush green meadows. There is no village and no hotels so frequency of people traveling too is not that great. Your best bet of finding a shared taxi is from the Tourist taxi stand near Nehru park of the main Srinagar Bus stand. If you do not find a direct cab for Doodhpathri; then the journey would have to be broken into reaching different destinations; that I mentioned above in the route. Best would be to first reach Budgam or Khan Sahib by either a Bus or shared taxi; and then look for a cab from Khan Sahib for Doodhpathri. Continue reading for more details. Like shared cabs, traveling by Bus is not going to be easy either. There is no direct bus from Srinagar to Doodhpathri; and the journey would have to be completed in parts. Your first task would be to reach Lal Chowk in Srinagar and catch a bus for Budgam. From Budgam, next destination would be the small town of Khan Sahib. Chances are that the Bus would actually pass through Khan Sahib before reaching Budgam; in which case you can just get down here. If however the bus reached Budgam via Magam, then you will have to catch a shared cab for Khan Sahib. From Khan Sahib stand you can get a cab for Doodhpathri. Apart from Lal Chowk, another place you can board a bus for Budgam in Srinagar is the Humhama area; just two kilometers from the Airport. You can also get a cab for Doodhpathri from Budgam itself; so do ask around before going to Khan Sahib. A shared cab is pretty much the only choice; as there is no bus going to Doodhpathri from either Budgam or Khan Sahib. Srinagar Airport is the nearest airport to Doodhpathri. It is located about 50 kilometers from Doodhpathri and the journey can be completed in 2 to 3 hours. The major airlines operating regular flights to Srinagar are Air India, Jet Airways, Spice Jet, Air Asia, and Indigo. Srinagar railway station is the nearest railway line to Doodhpathri. Problem however is that it is not yet fully operational and connected. At the time of writing this article; it will take at least another 18 months to 2 years for a full connectivity. Right now, you can reach till Udhampur by train. From Udhampur, you will then have to board a bus or taxi for Ramban. After reaching Ramban, you will then board another train from Ramban to Srinagar. An easier way thus would be to just board a bus or shared taxi directly from Udhampur to Srinagar. Now all of the above was about reaching Doodhpathri during summer. In winter however, it is a completely different story. This enntire area gets buried under several feet of snow and so does the road leading here. It then becomes impossible for a normal car to climb up the final stretch and the steep climb to Doodhpathri. During this time, only 4×4 vehicles ply on this route and that too with snow chains. In winter, my advice would be that you do not bring your own vehicle. You can then just catch a cab from Srinagar to Budgam or Khan Sahib first; and then another 4×4 cab from Khan Sahib to Doodhpathri. If you brought your own car or motorcycle; it will then become a problem about where to leave it parked; because you may not be able to get it all the way to Gulmarg. A 4×4 cab with snow chains from Budgam or Khan Sahib will cost about Rs. 800 to Rs. 1000. Weather of Doodhpathri can be best described as pleasant in summer and very cold in winter. In January and February, it receives heavy amount of snow and the temperature falls several degrees below zero. Snow starts to melt in March; and weather turns to more of a pleasant cold than harsh cold. Spring arrives in April and the meadows get covered with a green carpet of grass. From April to June is considered to be among the best of times to plan a visit to Doodhpathri. Monsoon arrives in July and it can rain here anytime; though the amount of rain it receives is not too much. August and early September once again see lush green all around after Monsoon has passed. Cold starts to settle in again towards end of September; and by November, it can snow here anytime. Below is a month by month breakdown of how the places look at these respective times. Doodhpathri in January – Snowed out completely, white all around. Reaching here in this month can be a bit of challenge. Temperature several degrees below zero. Doodhpathri in February – Same as January. The amount of snow however will be greater. Doodhpathri in March – Snow starts to melt. It will mostly be gone from the meadows by Mid March. Doodhpathri in April – Spring season is here. Weather turns pleasant, snow is limited to upper areas only. Doodhpathri in May – Starts to get warm. You can easily walk around in your cottons only. No snow around anywhere. Doodhpathri in July – Monsoon arrives in July. It can rain here anytime but the amount of rain that Doodhpathri gets is not high. Weather remains to be very pleasant with lush green meadows all around. Doodhpathri in August – Same as July. It will however be ever more lush. Doodhpathri in September – Pleasant in beginning of the month but cold starts to settle in by end of September. Doodhpathri in October – Very cold and a bit dull as well with greenery all gone and dried up grass. Not a good time to visit. Doodhpathri in December – It can snow anytime here in December. Once again, not a good time to visit. The best time to visit Doodhpathri is during the spring and summer months from May to September; but it will also heavily depend on what exactly are you looking for. If you want to see white valleys and meadows buried under snow then February will be the best time to visit. But if lush green is what you are after then April, May, July and August will be the best. If rain makes you uncomfortable then you may want to avoid August altogether. It will depend on which month of the year you are visiting here. In the months of winter, from October till March, you will need all heavy woolens with windproof jackets to protect you from the cold. During spring or summer season however, your regular cottons will do just fine. Even wearing a light jacket here from May till August will start to feel warm after a bit of walking around. Reaching Doodhpathri can be a bit of challenge in the months of January and February. The entire area receives heavy amounts of snow which may lead to closure of the roads. Please inquire at Srinagar before you plan a trip here in winter. Doodhpathri itself is actually a tourist attraction that you see while visiting Kashmir. As I mentioned previously, there is nothing here really except for a huge green ground sitting in the middle of mighty peaks all around. There are no big tourist attractions or adventure sports happening here. It is just natural beauty at its best with tranquil enough to soothe your soul. There are however a few places near Doodhpathri that too are worth mentioned and visiting. Tangnar: You will be crossing Tangnar while going to Doodhpathri, about 2 to 3 kilometers before. It is a beautiful place of small valleys with Deodar and Pine trees on small hills and worth a brief stop. Mujhpathri: The name Mujhpathri literally translates to Valley of Turnip. It is a small hamlet situated on the bank of river shaliganga and is about 3 kilometers away from Doodhpathri. Palmaidan: The name Palmaidan means a Big stones ground and that is what it is. It is another meadow like Doodhpathri but with huge stones all around. Situated at a distance of about 5 kilometers from Doodhpathri, it is a favorite spot of shepherds to graze their cattle and livestock. In short it is a beautiful place surrounded with with Deodar and pine trees and a small stream running on one side of the ground. Diskhal: It is a beautiful meadow on the top of the mountain and overlooks the Ashtaar glacier. It is around 10 km trek from Shaliganga nallah in Doodhpathri. A few other places near Doodhpathri that are worth visiting are Dophkhal, Sochilpather and Parihas. Absolutely nothing is the answer and that is what you should come here for. It is a place where you just sit down with family and friends, or even alone if you were traveling solo, and just savour the vistas around. Doodhpathri is not a sight that you get to see every day; and you should have your fill of it while you are here. Even people of Kashmir come out here to picnic, that is how beautiful it is. Photography is an activity that you would love to indulge yourself in here. Camping and trekking are two other activities; but keep in mind that there are no such facilities available at Doodhpathri itself. There are no camp sites here so you will have to bring your own tent and know how to set it up. The place is inhabited by a few shepherds during summer; and they sell tea and a few other items to eat here. I would advise that you set up you camp to someplace close to shepherds huts. You can also pay them to cook food for you. There is wildlife around here, specially bears, so try not to camp all on your own in the middle of nowhere. Same thing applies for trekking as well. Do not go wandering around alone as you may encounter wildlife; or get lost in the woods. Either bring a guide from Srinagar itself; or hire one of the local shepherds to show you around. There are a few pony owners here as well; and they will start asking if you wanted a pony ride the moment you arrive here. If you wish, you can even ask these guys to be your trekking guide. There are no hotels or guest houses here and the nearest place you can hope to find one is Budgam. The place is primarily for sightseeing as it has not been developed completely as yet. My advice would be to make it a day trip and return to Srinagar by evening. If you were carrying your own camping gear then yes, you can stay at Doodhpathri for the night. There are plenty of camping spots here. You won’t find anything to eat here and will have to bring your own food along. There are a few shepherd huts selling Kashmiri tea and some snacks but that is pretty much it. Either bring your own food or eat on your way at the nearest village about 5 kilometers from Doodhpathri. There are no Banks or ATM here. The nearest one is at Khan Sahib. There is no gas station or mechanic at Doodhpathri. The nearest one is at Khan Sahib. No hospital or medical shop here as well. The nearest medical assistance is either at Budgam or Khan Sahib. For something serious however, you will have to rush to Srinagar. There are no shops as well at Doodhpathri so nothing to buy. Your shopping would have to happen in Srinagar only. The road is mostly a smooth run all the way from Srinagar to Doodhpathri. It is a single lane highway though with traffic coming both sides but condition of the road is not bad at all. Until Khan Sahib, you won’t even feel like you are traveling through hilly region actually as the road is mostly flat. It is only after Khan Sahib that you climb up a steep ascent to reach Doodhpathri. There is really no big itinerary required for Doodhpathri. Start from Srinagar after having your breakfast by 9 AM; and you will reach Doodhpathri by 11. Spend some time, relax, walk around and have fun. There is a river at Doodhpathri and you can actually drive all the way to it. Right before the river is a parking spot. Leave your car there, walk down the river and have fun in the water. I will recommend trekking a bit against the river towards the top. The vistas will improve tremendously; but be careful though because you will be walking through some big boulders. Stay as long as you want to but be on your way back to Srinagar by 4 PM because it will take you at least another 2 hours to get back. If you want to, then you can mix Doodhpathri and Yusmarg together on the same day. But for that, you will have to start early from Srinagar, possibly by 8 AM. Travel to Doodhpathri, spend some time; and then drive the same way back to Wullin. 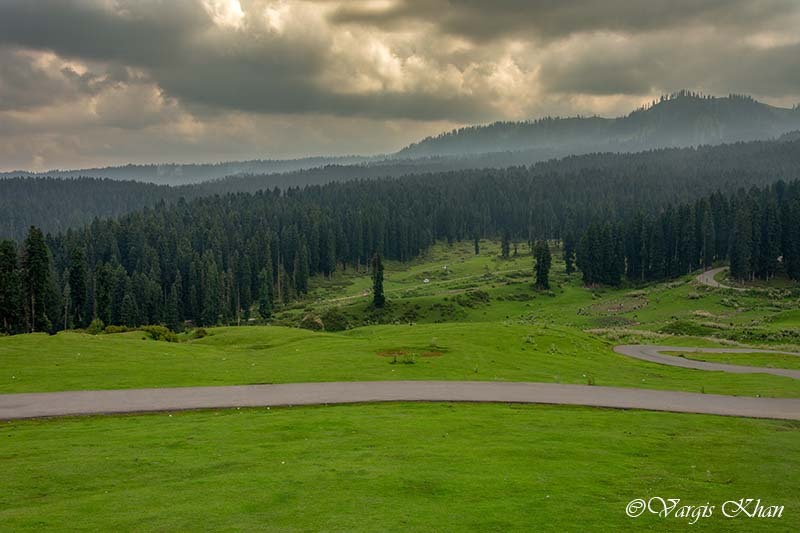 From Wullin, take the road towards Charar-e-shariff and reach Yusmarg. You can also mix it with a trip to Gulmarg. Start early from Srinagar, visit Doodhpathri, drive all the way till Wullin; and then take the road towards Magam to reach Doodhpathri. Below are distances to some major places nearby from Doodhpathri. I think that pretty much covers all that you need to know about visiting Doodhpathri. If you have any further question or need any other details, please feel free to ask in the comments section below; or at our Community Forum; and I will be glad to answer. Is Doodhpathri safe to visit after pulwama mishap? As it is offbeat site and lonely place. I am coming to kashmir next month first week. Thanks Aryan and Yes, it is safe enough.